In times of difficulty and danger, our true friends are revealed to us. 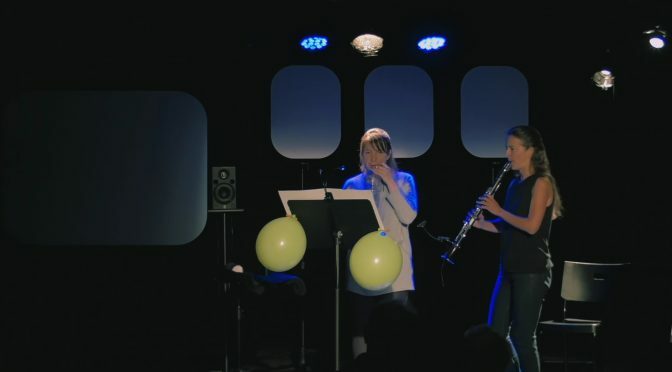 In June, 2017, ensemble IN EXTENSIO performed my “A bear whispers” (for clarinet and camping paraphernalia) in a concert, entitled BacKpacK MusiC, at le Petit Outremont in Montreal. A bear whispers is a musical recounting of Aesop’s (7th century BC) fable, Two Travellers and a Bear. The music was created specifically for this event, featuring the premieres of several new works developed for an all-ages audience. After a long hike, two friends decide to build a campfire and rest. Suddenly, a bear comes upon them. One of the hikers quickly climbs up a tree in an effort to save himself from the bear. The other hiker, feeling he has no other option, falls to the ground and plays dead. The bear sniffs out the fallen hiker from head to toe and appears to whisper something to him. The hiker holds his breath because it is said that bears do not eat dead animals. The bear finishes sniffing around and then leaves. The hiker in the tree climbs down and asks the other what the bear whispered. The bear said, “in the future, never travel with friends who desert you in times of danger”. BacKpacK MusiC is a multimedia concert based on a narrative featuring two travelling musicians from the digital age. The musicians undertake a journey, passing from district to district and city to city with merely one backpack replete with new music. BacKpacK MusiC est un concert multimédia basé sur une trame narrative mettant en scène deux musiciennes de l’ère numérique voyageant de quartier en quartier, de ville en ville, avec littéralement pour seul baggage un sac à dos plein de nouvelles musiques.